Marinating your chicken in pickle brine helps keep it from getting too tough or dry while it cooks. The baked chicken doesn’t taste identifiably like a pickle, it just has a little bit of sweetness to it. Any variety of pickles would work here though – dill or spicy would both be fun! You are not using the pickles themselves for this recipe, but they would be a great addition if you serve your chicken on a sandwich (and depending on the container you use you may not even need all of the juice). Place your chicken in a coverable container that is wide enough to allow your tenders to sit side- by-side in one layer. Strain the juice from your pickle jar into the container until the tenders are completely covered. Allow to marinate for at least 4 hours or up to 12 hours. Preheat your oven to 425 degrees Fahrenheit. Prepare a baking sheet with cooking spray. In a wide, shallow bowl, toss panko and paprika to combine. 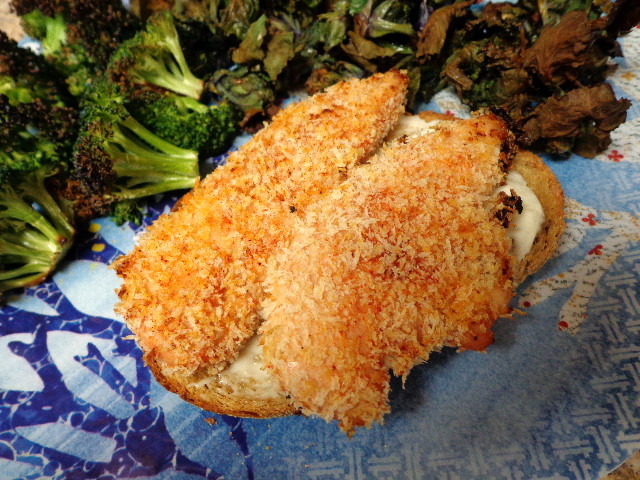 Remove tenders from the marinade and dredge in the panko mixture, flipping to coat both sides. Place chicken on prepared baking sheet and bake for 20 minutes, carefully flipping the tenders over at the 10-minute mark.